1X4 HDMI 2.0 splitter 4K This 1x4 HDMI Splitter uses a single HDMI source, accessing to multiple HDMI sinks. .. 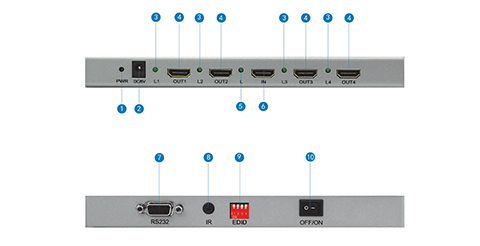 This 1x4 HDMI Splitter uses a single HDMI source, accessing to multiple HDMI sinks. It allows one HDMI device to be split easily to eight HDMI compatible monitors or projectors.